Enjoy morphing crystals in various patterns based on the weather forecast! A centerpiece for everyone to experience! Great for gifts all of occasions! ♥♥Fitsky storm glass♥♥ are gifts full of love, bringing happiness and fortunate, expressing bless and appreciation. 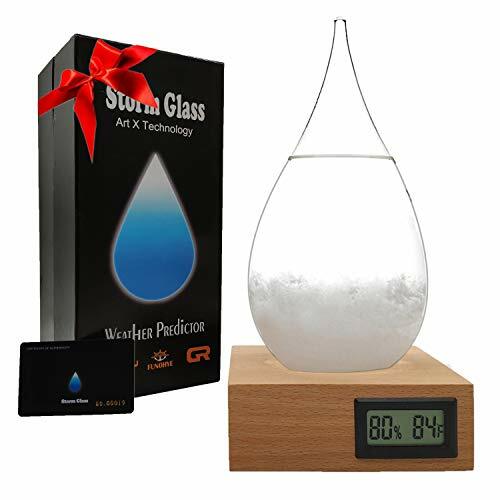 ✿Perfect After-Sale Service✿Genuine guarantee card - Every genuine storm glass has a genuine guarantee card. Different from ordinary storm galss on the market. Only Fitsky's Storm Glass with a DOUBLE GUARANTEE! Every Storm Glass Weather Barometer is backed by our Manufacturer 30 day money back guarantee with one year free replacement warranty! 100% satisfaction and money back guarantee. Please feel free to contact us if you have any concern about this item. We will try our best to promise you an enjoyable shopping experience ! Art X Technology GIFT -Captivate the room with the elegant design of Fitksy storm glass! Its unique water drop shape andwooden base with LED temperature/humidity display make for a great center piece in any living room, bedroom, kitchen, office, bar, restaurant, or hotel room! With its minimalistic design, it's big enough to make a statement and small enough to fit just about anywhere! It's a gem all year round with its constant weather crystal morphing abilities! Genuine guarantee card - Every genuine storm glass has a genuine guarantee card. Different from ordinary storm galss on the market. Only Fitsky's Storm Glass with a DOUBLE GUARANTEE! Every Storm Glass Weather Barometer is backed by our Manufacturer 30 day money back guarantee with one year free replacement warranty! If you have any questions about this product by time cat, contact us by completing and submitting the form below. If you are looking for a specif part number, please include it with your message.